Abbey Road Artists’ Studios is a resource for professional artists of all disciplines set in the heart of Athlone Town. It comprises three individual studio spaces available for both long and short-term lettings and one studio space allocated to the Abbey Road Community Artist Residency Scheme. The Laois Arthouse has been open since 2011 and is run by the Laois Arts Office. It is a workspace for artists, local, national and international. It is also an important point of contact for the general public to engage with artists through workshops, exhibitions and residencies. Situated in the converted Courthouse in Stradbally. 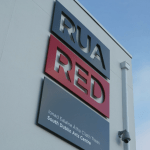 RUA RED is a dynamic home for the creation and enjoyment of the arts. 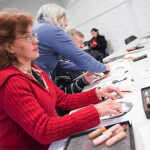 Along with partner organisations and tenants, the centre hosts a diverse programme of events aimed at members of the local community as well as national audiences. This multi-purpose arts resource aims to be a driver for wide public access to the arts. Visualise Carlow was launched in 2001 as an advance programme to the opening of VISUAL, Centre for Contemporary Art, Carlow. 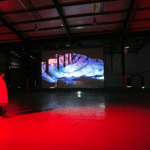 Visualise Carlow was managed by the Carlow Local Authorities Arts Office, its main purpose was to articulate an artistic vision for what was to come in VISUAL– the very best in contemporary art.